2nd Annual Grass-fed Barbecue This Saturday! 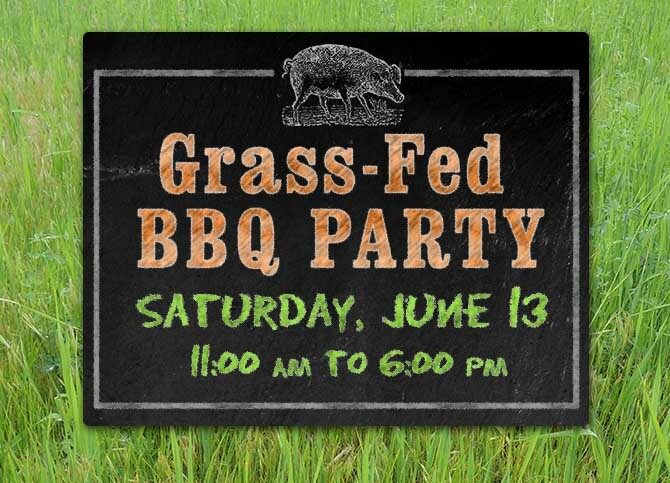 Come celebrate our pastured meat at the second annual Grass-Fed BBQ! It will be a day of fun and food, featuring pasture plates of spit-roasted bbq pork sandwiches with sides by guest chef Doug Duda of DudaQ, desserts by The Gingered Peach, and beer by Flying Fish Brewing Company. Lounge on the grass and listen to tunes by Slowey & The Boats (on stage 11:30 am) and The Barn Owls ( on stage 2:30 pm). Chef Rachel Weston will demo recipes & sign copies her new cookbook “New Jersey Fresh.” There will be hayrides and farm games for the family, farm tours & iron forging demonstrations – and more! Join us for tons of sustainable fun! $10.00 entrance fee per car. Beer proceeds to benefit Pinelands Preservation Alliance. Thanks to everyone who stopped by the farm this past weekend to have a grilled cheese sandwich prepared by Chef Carmine and Jeremy! Despite soaring temperatures and threats of afternoon thunderstorms, many showed up to enjoy soup, sandwiches, and a beautiful afternoon on the farm. 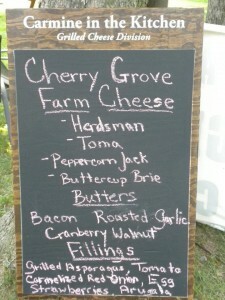 This past Saturday, Chef Carmine set up his grill cheese-making station outside the Cherry Grove Farm Store. He got to work cutting cheeses, prepping vegetables, including fresh asparagus and juicy tomatoes, and slicing still-warm bread from The Village Bakery. Each sandwich was hand prepared using fresh and local ingredients. 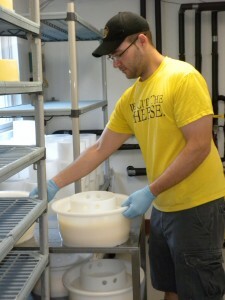 Customers chose from a selection of Cherry Grove cheeses, Village Bakery bread and Chef Carmine’s roasted vegetables. We got to talk with some customers, and take peeks into their sandwiches! 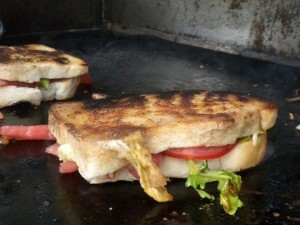 If you didn’t get to the farm for a sandwich, check out a few of the pictures we took. Just a warning though, we guarantee that once you see these sandwiches, you won’t want to miss another grilled cheese day! Don’t just take our word for it though; listen to what customers are saying. Here’s what Melissa, a Carmine’s sandwich novice, had to say about her whole grain bread, Herdsmen and Toma cheese, grilled asparagus, arugula and tomato sandwich. “To start with, it was beautiful. I loved that Chef sliced the bread right there. 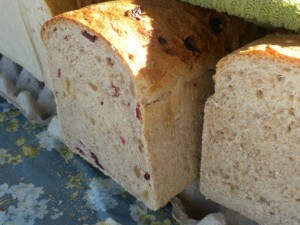 Freshly baked bread, sliced right on sight! They were fun to talk to, too, while I waited for my sandwich. And they have this secret sauce…whatever it is that they used to butter the bread before grilling was delicious. The cheeses melted and complimented each other into a gooey trifecta of perfect vegetables, cheese and bread. Yum! I’ll be back,” Melissa told us. Grilled cheese sandwiches are simple. Bread, butter, and cheese layered together and thrown in a hot pan is not exactly the most complicated recipe. Something magical happens, though, when the butter browns and begins to slowly toast the bread while the cheese starts to melt. When you add deliciously sharp and salty Cherry Grove Herdsmen Cheese and Village Bakery bread to the mix, you get the ultimate in grilled cheese sandwiches. So to everyone who has experienced this bliss, you’re welcome to share your stories on our Facebook page! We’d love to hear your feedback. And newcomers are invited to join us for our upcoming grilled cheese Saturdays, happening each Saturday here at the farm from 11am-3pm all through the month of June! Check back here and on Facebook to find out when Chef Carmine will be cooking next! To contact the Chef directly, you can call Chef Carmine Sacchitello at 732-606-7467, or visit his Facebook. 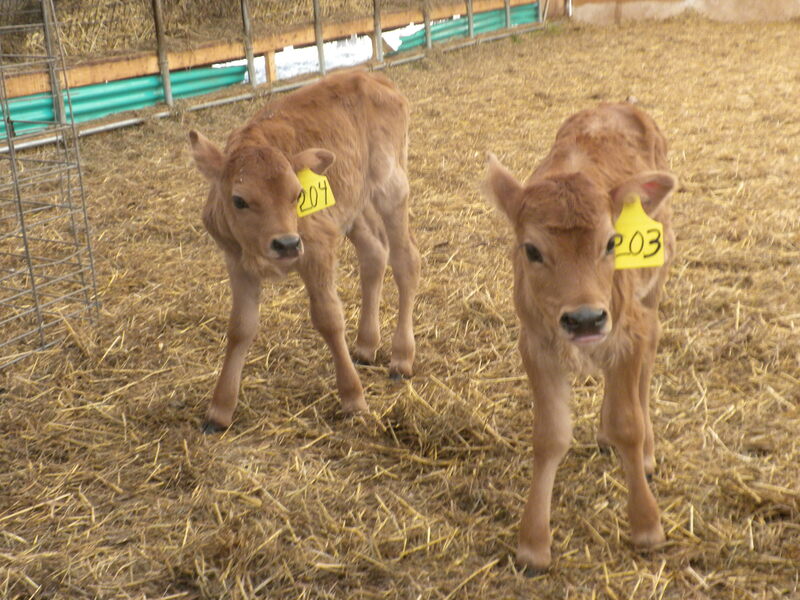 Name Our Calves-Your Vote Counts! 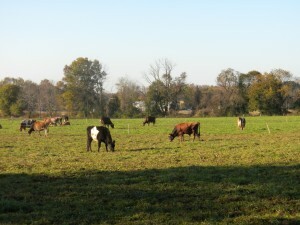 Be Creative & Come By The Farm Thursday – Monday To Help Us Name Our Future Milking Herd! Calving season is here and so far we have 7 girls looking for names and milk. 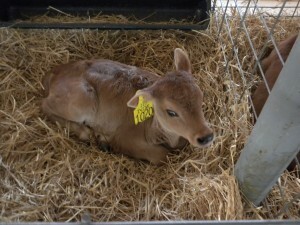 Help us by picking names for our 2012 Spring calves, be creative, have fun and everyone’s vote counts! We will collect the votes by Sunday, April 15th and announce the selected names on Monday, April 16th. Your Vote Counts – Be A Part Of Cherry Grove Farm! After One Long Day Of Counting The Voted And Making Lists We Have Come Up With A Top 3 Plus The Voters Choice Option For Each Calf. 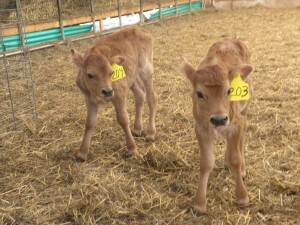 Now We Need You All To Vote Just One More Time To Help Us Narrow It Down To A Winning Name For Each Calf. Use The Photos Above As A Reference Point. Thanks Again For All Your Help! Great Job Everyone We Will Be Writing The Winning Names On The Girls Tags So For Years To Come You Can Come To The Farm And Watch Them Grow Up Into Our Milking Herd. What is The Great Meadows Cow Parade? 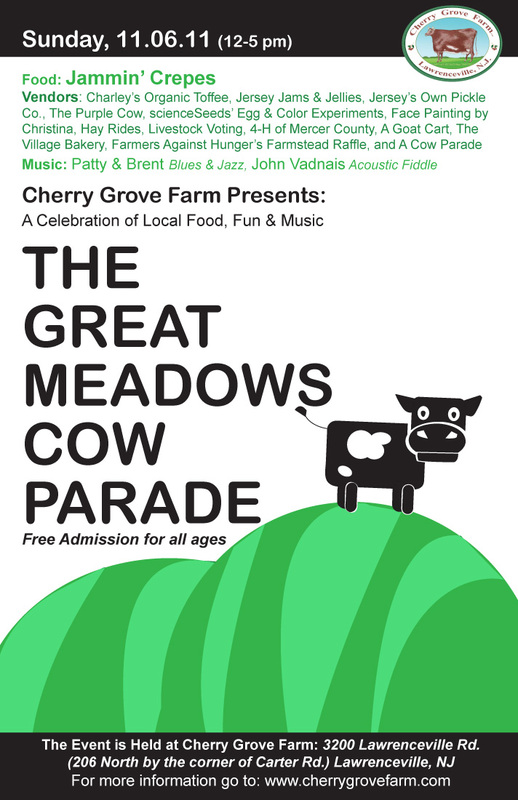 Everyone here at Cherry Grove Farm hopes you can make it out to our Great Meadows Cow Parade event on November 6th from 12-5 pm. The event is to help shine light on all the great local food, fun and music we have here in New Jersey, and to provide a fun time for friends and families. Come out and enjoy our farm and taste your way through our farmstead cheeses; savor Jammin’ Crepes newest tastiest creations; warm up with Purple Cow’s Soups; experience new cheese pairings with Jersey Jams & Jellies; enjoy a sweet treat from Charley’s Organic Toffee. In addition, the kids can have fun with the 4-H club of Mercer, face painting with Christina and Science Seeds farmstead science experiments! Take a ride on our hayride or the 4-H clubs Goat Cart. You can even take part of the Farmers Against Hunger’s Farmstead Raffle full of giveaways and coupons. Don’t miss the full farm experience as we celebrate and thank our dairy herd for providing us with the most wonderful grass-fed milk to make our farmstead cheeses. Cheer on the procession as our herd marches through the scenic organic fields, concluding their parade in our milking parlor. We hope to see you all there!